The Miraculous Medal is one of the Church's sacramentals. It is a physical representation of a spiritual reality. Ever since its institution, the Miraculous Medal has been known to be a powerful source of drawing down God's grace to mankind, even in the form of miracles. That is why the Seminary is launching its Miraculous Medal Campaign. Help spread this marvelous devotion to Our Lady by requesting your medals here! As the medals are already blessed they cannot be sold as such. However, we are asking a for nominal fee to cover our shipping costs. Please note, prices have increased due to increased price of postage. Click here to request free and blessed Miraculous Medals. 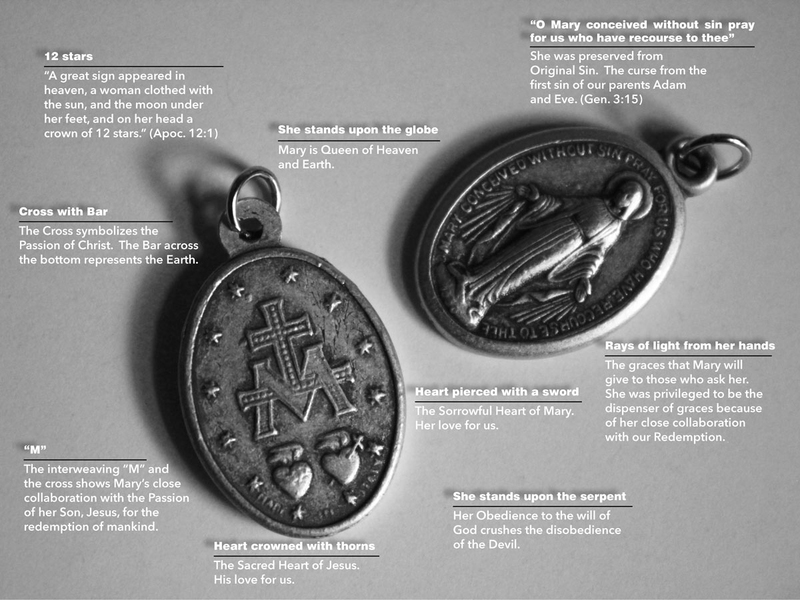 What is a Miraculous Medal? The Miraculous Medal is a sacramental, a means of disposing one’s soul to receive grace. The two main effects of a sacramental are to cleanse venial (lesser) sins by disposing the heart to sorrow for sin, and to help in overcoming temptations. A sacramental is not a good luck charm, or some kind of get-into-heaven free card. Rather, it is a link between earth and heaven, a physical manifestation of the spiritual reality of God’s love for us, and for the intercession of His Mother. 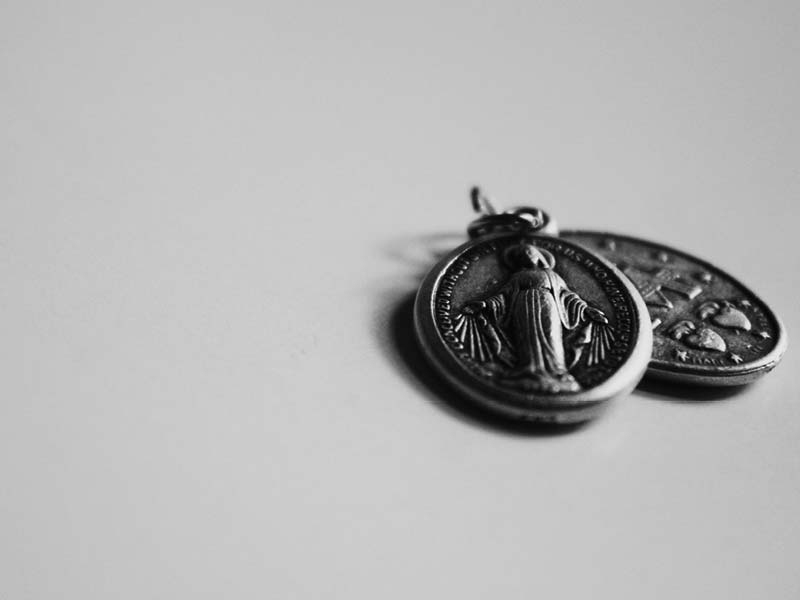 Like a locket that contains the picture of our mother, the Miraculous Medal reminds us of her, and helps us to call on her and speak to her when we are in trouble. And because God wants us to use physical sacramentals to remind ourselves of spiritual realities, he grants his grace in a special way to those who use them in this way. On the front of the Medal, Our Lady stands upon a globe representing the earth, and crushing a serpent representing the devil (see Genesis 3:15). The rays streaming from her hands signify the graces that she pours out upon those who ask her intercession with her Son. The date 1830 refers to the year of the vision of St. Catherine Laboure. On the back of the Medal, the Sacred Heart of Our Lord and the Immaculate Heart of Our Lady are the symbols of their burning love for us. The Sacred Heart is surrounded by a crown of thorns. The Immaculate Heart is pierced with a sword, showing the grief of Our Lady, as foretold by the prophet Simeon (Luke 2). The Cross is a sign of the Redemption accomplished by Christ, and it rests on a bar which is the earth. The M stands for Mary, and the interweaving of the Cross and M show her role in assisting the Redemption. The twelve stars probably refer to the Apostles, who represent the whole Church, standing around Jesus and Mary (Apocalypse 12:1). Catherine described the medal to her spiritual director and the first few were made under his direction, for she wished her own identity to remain secret. Although the Medal became instantly popular throughout the world, the identity of Sister Catherine was successfully hidden from the public for forty-six years, despite constant attempts to discover the visionary. Many miracles were soon reported by people who had worn the medal and recited the prayer, especially conversions and cures of those hopelessly sick, which led to its being named “The Miraculous Medal.” But during all this time, Catherine remained at her hospital, working as an obscure nurse. She died in 1876. Stories of miraculous favors connected with the Medal. Alphonse Ratisbonne was an agnostic lawyer and banker, with a strong hatred for Catholicism. In a chance meeting, an old friend of his dared him to wear the medal and recite the prayer, and see if he could remain unchanged. Ratisbonne took the dare, and the prayer began to echo in his mind, “like one of those songs from an opera which you sing without thinking of them, and then feel annoyed at yourself for singing it.” He began to have dreams of the cross, which disturbed him from getting any rest. While looking at the architecture in a church, he saw a vision of Our Lady, so beautiful that he could not bear to look upon her directly, but could only stare at her hands, which “expressed all the secrets of the divine pity.” He was immediately convinced of the truth of the Catholic Faith, was baptized, became a priest, and spent his life as a missionary. Catherine Laboure, the visionary who gave us the Medal, nursed the sick for her entire life without public recognition for her marvelous vision, at one point even denying a private interview to Pope Gregory XVI. When her tomb was opened in 1933, almost sixty years after she died, her body was found to be perfectly preserved with no signs of decay. Her eyes were still blue, and her arms and legs were still flexible, as though she was merely asleep. The body remains in that condition to this day, and can be seen in the chapel of the Sisters of Charity at Rue de Bac, Paris. Click here to request free and blessed Miraculous Medals. Click the picture above for an explanation of the Miraculous Medal.